WordPress 2.6 has tons of new features to already powerful WordPress blog publishing platform, and one of the feature is image captions which display a caption of text describing the image displayed on the web page, beneath under the image itself. 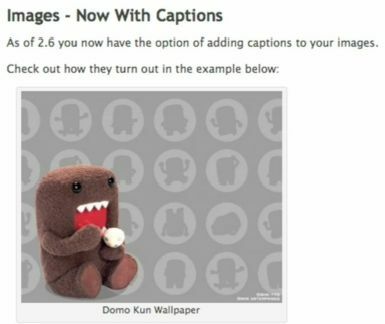 In fact, image captioning has been made default feature, and always turned on or enabled. With image captioning in WordPress 2.6, WordPress will automatically add caption shortcode to all images, graphics, photos, pictures, and videos inserted into blog posts and pages via Flash or classic media uploader. The shortcode [caption] and [/caption], which bracket the IMG, OBJECT or EMBED HTML elements will translate into <div> and </div> CSS attributes to position caption accordingly. Not every blogger will love or need the images caption feature though. Author can skip using using [caption] and [/caption] HTML code to avoid an image or embedded video clip been showing caption below it. However, deleting or removing the caption shortcode that automatically been added together with the insertion of photos and videos in the visual or HTML editor. For user who doesn’t want to use the image caption feature, and want to turn off and disable the automatic captioning (addition of caption shortcode) to images and videos, insert the following line of code into wp-config.php or the theme’s functions.php. Once added CAPTIONS_OFF parameter, the images caption function is WordPress 2.6 is disabled, and the caption shortcode does not work or translate anymore. But note that CAPTIONS_OFF constant is only a temporary variable available in WordPress version 2.6, as denoted in Changeset 8321. It’s recommended that WordPress user does not use this constant as it will no longer be supported in future version of WordPress. Changeset 8358 has made the changes to enable disabling of caption support via plugin’s filter, which likely to go live on WordPress 2.6.1. Update: For WordPress 2.6.1 users who want to disable captions feature, use Caption Disabler plugin.